The Arctic Oscillation (AO), shown below, is an important Arctic climate index with positive and negative phases, which represents the state of atmospheric circulation over the Arctic. The positive phase (red) brings lower-than-normal pressure over the polar region, steering ocean storms northward, bringing wetter weather to Scotland and Scandinavia, and drier conditions to areas such as Spain and the Middle East. 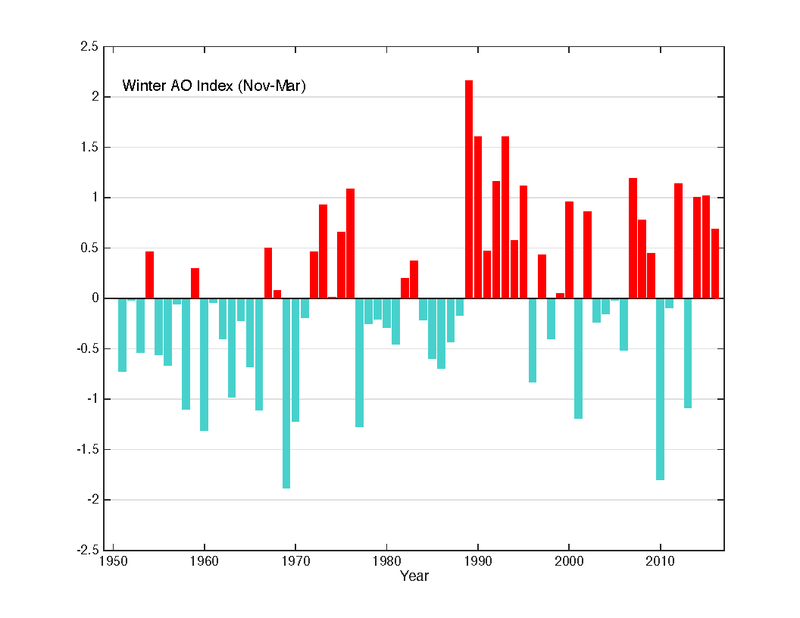 While the value of the AO index was strongly positive in the early 1990's compared to the previous forty years, the value of the AO has been low and variable for the last nine years. The year to year persistence of positive or negative values and the rapid transition from one to the other is often referred to as "regime-like". The Arctic Oscillation in Winter (November to March). "Why and how do scientists study climate change in the Arctic? What are the Arctic climate Indices?"